This release is part of the Follow That Dream Records series of Elvis Presley's movie soundtrack album reissues. 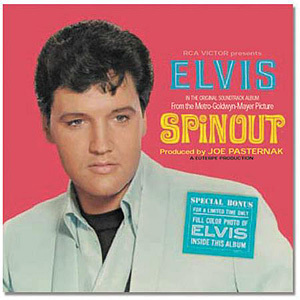 The Elvis movie soundtrack albums have been deleted from the regular SONY/BMG catalog. The Follow That Dream reissues allow them to continue to be available. Click here for the DVD of this movie! Click here for more about the FTD Music Label. Recorded February 16-17, 1966 at Radio Recorders, Hollywood.Session hours February 16: 3PM – Midnight.Session hours February 17: 7PM - Midnight. Musicians: Guitar: Scotty Moore, Tommy Tedesco, Tiny Timbrell, Bass: Bob Moore, Drums:D.J.Fontana, Buddy Harman, Piano: Floyd Cramer, Charlie Hodge on "Beach Shack", Sax: Boots Randolph, Vocals: The Jordanaires Overdubbed later: Strings (5307 only). The Spinout digipak is very nicely done. High quality photo front and back. Great booklet inside and sound quality of the cd is exceptional. Some pretty humorous dialogue on the studio out takes as well. It's a great collector issue and gives a good inside look at how they worked the songs up to the final release. You can't go wrong with this one. ??? ?